Home » Slider » Now Accepting Applications for the 2nd Annual Summer Flea! Do you have antique, re-purposed, gently used, or vintage items that you’d like to share with Market customers? Now’s your chance at the First Annual Summer Flea at the Downtown Farmers Curb Market! Submit your SUMMER FLEA application. Fill out the online application, and once approved, you’ll receive an email with the Summer Flea vendor agreement. This will explain all the rules for the Market, etc. We will have 10 spaces for Summer Flea vendors, and they will be placed on a first come, first served basis. We will neither require nor provide a tent, a table, or tent weights; however, tents are strongly encouraged given the strength of the summer sun. If you do bring your own tent, you must also ensure that it is properly weighted. Vendors are not allowed to park vehicles or trailers in the Market footprint. The fee is $30 per Saturday, from May 4 to July 27. Fees will be paid via check or money order on the day(s) vendors attend. 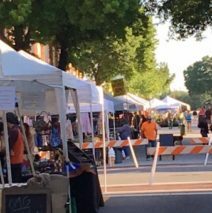 Market hours for May are 8am to 2pm. Market hours for June and July are 8am to 1pm. We do not allow items specifically packaged for resale, direct marketing products, used cosmetics or toiletries, or consumable or topical goods. No food products will be allowed because of insurance requirements and state regulations.